Pretschner, A., Peled, D., Hutzelmann, T.
Cyber-physical systems closely combine and coordinate subsystems consisting of both computational and physical elements. Such systems have become indispensable in the fields of aerospace, automotive and the automation industries, as well as in consumer appliances. Safety, security and reliability are all essential elements of the trustworthiness of these modern cyber-physical systems. Protecting the data within such systems from external attack (security) and protecting the environment from any potential malfunction or misuse of these systems (safety) are subjects traditionally considered separately, but a closer look reveals that techniques for the construction and analysis of the software-based systems used in both security and safety are not necessarily fundamentally different. This book presents papers from the 2016 Marktoberdorf summer school on software engineering, held in Marktoberdorf, Germany, in August 2016. 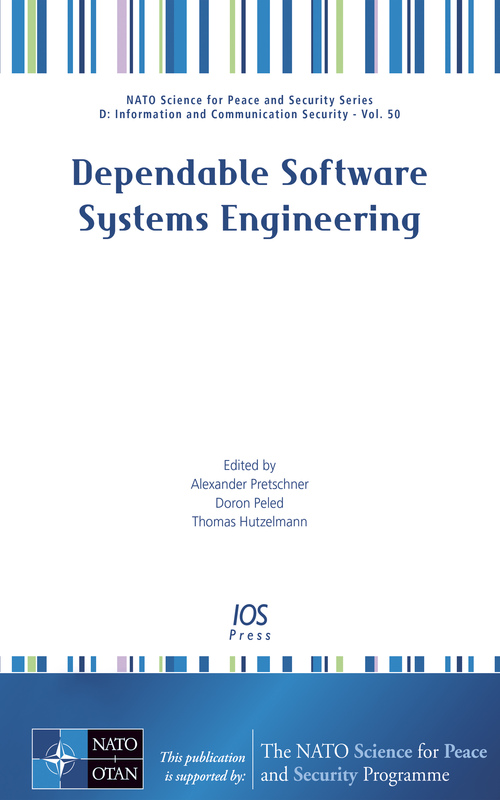 As its title – Dependable Software Systems Engineering – suggests, the lectures at this summer school explored various aspects of the engineering of more dependable software systems, and the 10 lectures included here cover subjects from programming languages and formal analysis tools to verification, validation and assurance. The book will be of interest to all those whose work involves the development and testing of more reliable and secure software systems.